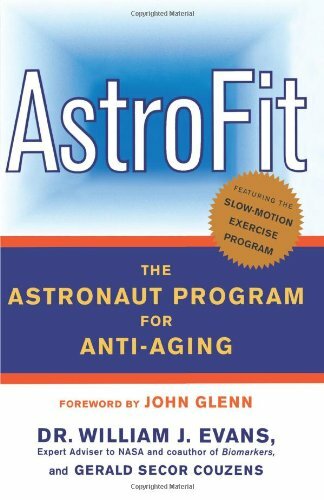 Turn your body’s clock back by up to thirty years with a revolutionary anti-aging, slow-motion muscle-building fitness regimen developed for astronauts! At the heart of AstroFit is a new, slow-motion E-Centric resistance-training regimen based on Dr. William J. Evans’ breakthrough muscle-building research for NASA. Evans, one of the country’s foremost advocates of slow resistance training, details his innovative strength-training regime centered on raising and lowering weights slowly to build more muscle. In just 30 minutes per workout — and without any special equipment — AstroFit helps you to shed extra pounds and retain a powerful, youthful body for the rest of your life. Dr. Evans also provides menus for two weeks of protein-rich meals that fuel your muscles, leave you energized, and allow you to eat for optimum health without hunger. And because it may sound too good to be true, first-person before and after accounts from his test subjects attest to incredible successes achieved in just ninety days! The AstroFit program grew out of extensive scientific research. On long space journeys, accelerated “aging” occurs as a result of prolonged weightlessness, causing crippling muscle and bone loss, as well as balance problems. The dramatic need for a program of age reversal for astronauts became a call to action for Dr. Evans, an expert adviser to NASA. As a result of his remarkable initiatives, astronauts now in training for an eventual mission to Mars will return in good health. Better still, readers of AstroFit can achieve the same age-reversal benefits right here on earth. With AstroFit you will: Prevent muscle loss and increase muscle growth, while trimming and sculpting your body • Stop bone loss and osteoporosis • Improve balance while enhancing muscle “memory” • Ensure permanent loss of body fat • Reset your metabolism level • Boost your immune system to maximum levels!